Talk about the American Dream! 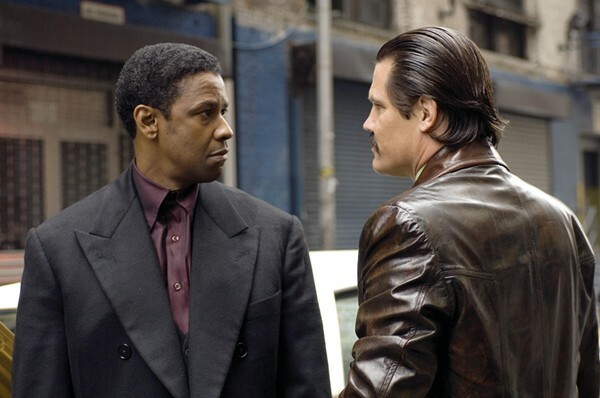 Frank Lucas (Denzel Washington) not only believed it, reached and surpassed it. The problem is that he did it while working on the wrong side of the law. From 1969 to 1973 Frank rose from the position of apprentice to Bumpy Johnson, a respected Harlem King Pin, to the most powerful Mob Boss of his time. Whereas Bumpy was rich, Frank became wealthy. To Frank the difference between the two is simple, cut out the middle man, create a brand name and never, ever call attention to yourself. Of course this is no simple task when you take into consideration the lengths and risks Frank took to create his empire, the excess which he enjoyed in his personal life and the number of Mafiosi he pissed off while climbing to the top. Frank was smart, ballsy and always took care of his own. Unfortunately, they say the higher the climb, the bigger the fall. Now on the right side of the law stands Richie Roberts (Russell Crowe). Richie is a New Jersey Cop who’s infamous for turning in one million dollars in unmarked bills. Money no one would have been able to trace, at a time when an honest Cop was harder to find than a non-smoker at an AA meeting. Having done so, he and his partner Javier Rivera (John Ortiz) become pariahs on the force. During this time in “purgatory” Richie studies law and miraculously passes the bar, destroys what’s left of his marriage and loses his partner. The death of Javier catapults Richie into the largest drug and policy corruption investigation in New York history. This is where Frank and Ritchie’s worlds collide. The roster of actors in this film is impressive from Misters Washington and Crowe, Rapper Common as one of Frank’s brothers, Cuba Gooding Jr. as a flashy drug dealer to Armand Assante as the classic powerful Italian Don. I was pleased with the way the film’s scenery runs the gamut from Queens, NY, Fort Bragg, NC to Hoa Binh, Vietnam. Director Ridley Scott must be given credit for taking us through so much. He manages to shock us with explicit violence, taking us through the oxy-moric beauty of the Vietnamese opium fields and suffocates us with the oppressive stench of a cocaine cook house in the middle of the projects. The movie left me feeling that there was a great attempt to tell an incredible true story while using great talent but that after much effort it falls short in the telling. There is so much to the story that the 2 plus hours don’t seem to be enough and the conclusion of the tale feels as if it was compressed to fit. All in all this film will entertain and the actors will impress you but you leave the theatre wanting a bit more of the story.